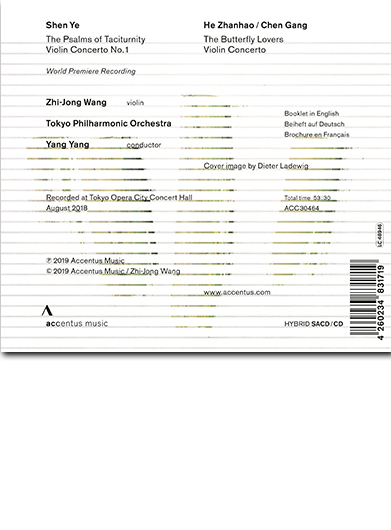 Hailed at its premiere as “a breakthrough in China’s symphonic music,” HE Zhanhao and CHEN Gang’s “Butterfly Lovers” Violin Concerto was later reviled during the Cultural Revolution for its Western influence and feudal Chinese inspiration. Though universally recognized among the Chinese people, the piece remains largely unknown in the West. A work of undeniable emotional appeal, it also carries with it a history that some of its biggest supporters are still struggling to digest. Borne of an uneasy union of revolutionary nationalist sentiment and Chinese urban cosmopolitanism, the musical progeny manages to be faithful to both its parents. SHEN Ye, teaching Composition at the Shanghai Conservatory of Music is one of the most fascinating representatives of contemporary Music in China setting accessible Chinese culture to his own musical language. His works are performed all over in Asia, the U.S. and Europe. all over the world and this is the world premiere recording of his 1stViolin Concerto „The Psalms of Taciturnity“.